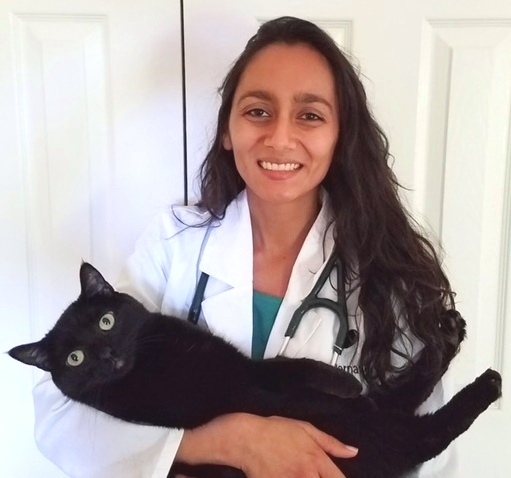 A Cat Clinic welcomes Dr. Nikhita De Bernardis to our feline practice! Dr. Nikhita De Bernardis: Meet our new doctor! Dr. Nikhita De Bernardis joined Dr. Mustillo and myself today! We are so excited to welcome her to our A Cat Clinic family here in Germantown, MD and know you are anxious to meet her as well. So here’s a little introduction. Dr. De Bernardis learned of A Cat Clinic from her parents, who are clients and proud kitty parents. After she graduated from Wootton High School in Rockville,MD, Dr. De Bernardis attended Cornell University for college and veterinary school. She completed an internship at the University of Georgia, then spent another year at Cornell while her husband completed his post-doctoral work in physics. Having always loved feline medicine, Dr. De Bernardis is especially interested in internal medicine and behavioral issues. She is in the process of getting certified in veterinary acupuncture and looks forward to offering this technique to our patients. We’ll write more about how acupuncture might be able to help our feline patients in a future post. In her free time, Dr. De Bernardis enjoys writing and traveling. She tries to incorporate volunteering with animal care organizations into her travels. She recently moved back to Maryland with her husband and their three cats – Sherlock Holmes, John Watson (pictured above), and Maxwell’s Equations. She looks forward to getting involved in the community to promote feline care. She is currently a member of the American Veterinary Medical Association and American Association of Feline Practitioners. Our goal at A Cat Clinic is to always provide the best experience for you and your cat when veterinary services are required. Having another feline veterinarian on staff will help us to achieve that, and should make scheduling appointments easier for you. Over the next few weeks, Dr. De Bernardis will be learning about our practice and meeting clients. Please say hello the next time you’re in!